The Amanita family contains roughly 24 species in Britain and some are among the most deadly poisonous mushrooms in the world. 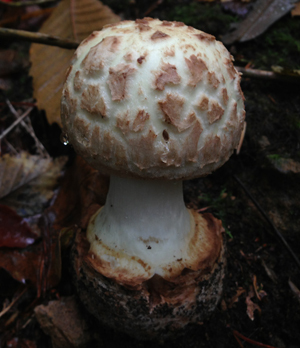 Some Amanitas are edible but they are not mushrooms we consider safe for the novice forager. The most important thing for any novice forager to learn is how to recognise the Amanitas and what edibles they can look like. Before even considering eating any of the edible members of this family, or picking any mushroom that can look similar to them, it is worth noting that there is no known cure for the combination of toxins found in some Amanitas. A slow death is likely if you ingest these mushrooms, accompanied by terrible pain and extreme gastric problems as they destroy your internal organs. Identifying all the Amanitas can be tricky but there are some key characteristics most share that you should look out for. How to Identify the Amanitas. 1. All have white gills, and white spores. 2. All normally have a bulbous base, so when identifying mushrooms you don’t know; it is important to get to the very base of the stem or stipe to see whats there. This can often be buried under the forest detritus or even the mud itself. 3, Many grow from an egg sack like structure called a volva. 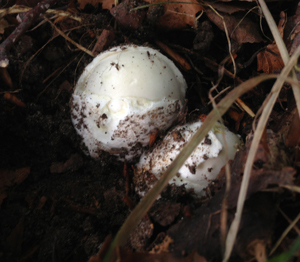 The picture below right is of a couple of Death Cap eggs hatching. The volva can closely resemble other young mushrooms such as puffballs or stinkhorn eggs or even young Agarics (field mushroom types), so this should be taken into consideration when harvesting any of those edible mushrooms. 4, The remains of the volva can often be seen on the top of the cap of the mushroom, particularly the Death Cap, which often has the white remains of the volva left. 5, Most have a skirt, and the skirts can either be smooth or striated. Look closely at the skirt characteristics when you start to try to identify the individual species within the family. The Grisettes; a sub species of the Amanitas generally do not have skirts. Be aware that the skirt on a mushroom can sometimes come off due to weathering or being brushed or blown off. 6. 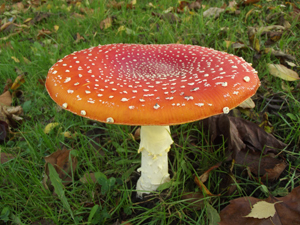 Many have speckles or spots on the top as with the archetypal gnome seat, The Fly Agaric or Amanita muscaria pictured below right. This is a very interesting mushroom, and though it is occasionally used recreationally it falls into the deadly mushroom category as it has been known to cause deaths. 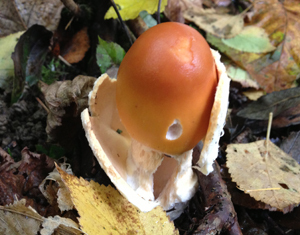 Each Fly Agaric mushroom has an unknown quantity of the poison muscarine in it which can have fatal effects. Different members of the family have slightly different types of speckles, some are scales left from when the mushroom broke through its egg, some seem to be flaky and some are much more like a calcite build-up on top of the cap. All of these different types of ‘speckles’ can be washed off by the rain, and some of the most deadly members of the family often have no speckles at all. Puffballs; small white puffballs can resemble Amanita eggs, always cut your puffballs in half and make sure there isn’t a little mushroom inside to be sure you don’t have an Amanita. Young Field Mushrooms or other Agarics; if you pick a young Agaric before the cap has opened then you are running the risk of it being an Amanita. Check the colour of the gills, with the Amanitas they will always be white and with young Agarics they will always be off-white to pink. 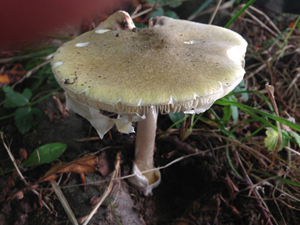 Russulas; the Gemmed Amanita can look like the common yellow Russula if all of the speckles have been washed off the top. Check the shape and texture of the stem. 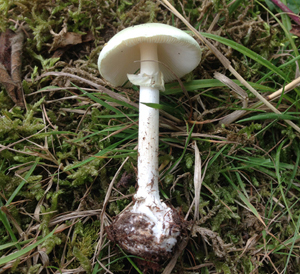 The Russula stem will be straight and white like a stick of chalk and have no skirt. The Amanita stem will be bulbous at the base, and probably have a skirt. 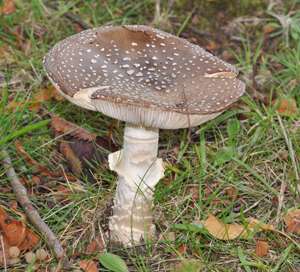 Parasols; there are a number of superficial similarities between the Parasol and the Amanita family. Check the cap of your Parasol to make sure it is actually scaly rather than having scales you can brush off and check the skirt on the stem, it can be moved up and down on Parasols. Edible Amanitas; the most likely mistake to make is when picking other edible members of the Amanita family, so if you are going to try experimenting with edible Amanitas extreme caution is required. Never eat any mushroom from this family unless you are 100% sure of what it is and that it is edible. Never eat any members of this family raw. As I have mentioned before there are deadly poisonous members of this family but some are edible. The article below details how to identify one edible member of this family. You use the content of this article at your own risk though!